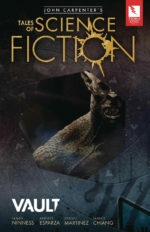 Space Station Benson has fallen and hellish monsters roam its corridors. Jake Dixon is left with a stark choice to save Earth and his friends, but at what cost? 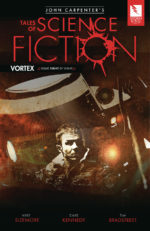 Horror, action and sacrifice bring Vortex to its shattering conclusion. When the moon-bound crew of Gaia stumbles across an enormous alien vessel, more technologically advanced than their own, priorities change. The mystery deepens when the crew discovers the name of the vessel along the hull, written in English: VAULT.